There's plenty to keep children engaged at Mirehouse these Easter holidays. In the house the history trail, owl hunt and live piano music keep youngsters and grown ups alike entertained and returning for more. In the gardens, the woodland playgrounds and family natures notes are always popular. 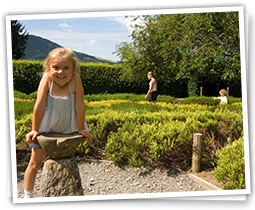 There is also plenty of space to burn off excess energy along the heather path maze in the Bee Garden, on the terraced lawns and skimming stones by Bassenthwaite Lake. A special Easter chocolate treats awaits all children visiting the house on Easter Sunday - do come in! We are now open for the season. 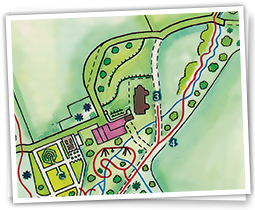 The grounds, playgrounds, lakeside walk and Old Sawmill Tearoom are open daily from 10 am until 5 pm. The house opens on 3rd of April, on Wednesday, Thursday and Sunday afternoons. We look forward to welcoming all our visitors until the end of October. 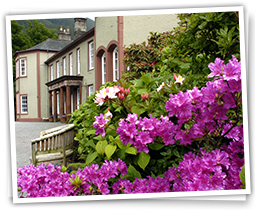 We are proud to be part of Cumbria's Living Heritage, a great collection of historic houses, gardens, castles, ruins and attactions in and around the Lake District. From Kendal to Keswick, there are 33 properties to explore - find inspiration for dog friendly attractions, days out with kids and places with cafes and restaurants. Each member is unique as seen by their "15 Minutes of Fame" claims! While the house is open on Wednesdays afternoons in September, the West Cumbria and Border Lacemakers demonstrate their highly skilled techniques of Pillow (or Bobbin) lacemaking to visitors. 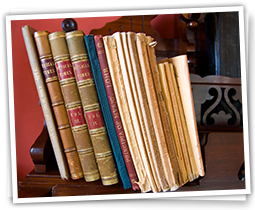 Come and watch their fingers fly as they work at their craft in The Study at Mirehouse and enjoy the piano in the Music Room next door. We are delighted to announce that the Mirehouse Poetry Competition for 2018 has now been judged. The competiton is held in conjunction with the Words by the Water Festival - more details are available on our dedicated Poetry Prize page. We have just been presented The Visitor Attraction of the Year Award 2017 in the Cumbria Tourism Awards. We are delighted and so honoured. Everyone at Mirehouse & Gardens works so hard to welcome our visitors and this award is for all of you - thank you.